Horace, in full Quintus Horatius Flaccus was an outstanding Latin lyric poet and satirist under the emperor Augustus. His father owned a small property and could afford to take his son to Rome and ensure personally his getting the best available education. In about 46 BC Horace went to Athens, attending lectures at the Academy. Early in 38 BC he was introduced to Gaius Maecenas, a man of letters from Etruria in central Italy who was one of Octavian’s principal political advisers. In 35 BC Horace published Book I of the Satires. These poems drew on Greek roots, stating Horace’s rejection of public life firmly and aiming at wisdom through serenity. He discusses ethical questions: the race for wealth and position, the folly of extremes, the desirability of mutual forbearance, and the evils of ambition. After Octavian had defeated Antony and Cleopatra Horace published his Epodes (poems full of mockery, though Horace attacks social abuses, not individuals) and a second book of Satires. 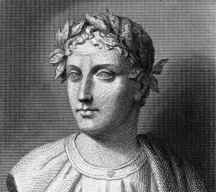 After 27 BC Horace turned, in the most active period of his poetical life, to the Odes, of which he published three books in 23 BC. Horace, in the Odes, represented himself as heir to earlier Greek lyric poets but displayed a sensitive, economical mastery of words all his own. He sings of love, wine, nature, of friends, of moderation. Very shortly after 23 BC, he set to work on three epistles, all relating in different ways to poetic activities. The third, the Epistle to the Pisos, was also known, at least subsequently, as the Ars poetica (“The Art of Poetry”). In 17 BC he composed the Secular Hymn (Carmen saeculare) for ancient ceremonies called the Secular Games. In 8 BC Maecenas died. One of his last requests to the Emperor was: “Remember Horace as you would remember me.” A month or two later, however, Horace himself died, after naming Augustus as his heir. He was buried on the Esquiline Hill near Maecenas’ grave. A biographer of the 2nd century AD quotes a jocular letter he received from Augustus, from which it emerges that the poet was short and fat. He himself confirms his short stature and, describing himself at the age of about 44, states that he was gray before his time, fond of sunshine, and irritable but quickly appeased. Already at the time of Horace’s death, his Odes were suffering the fate he deprecated for them and had become a school textbook. But their excellence was so great that they had few ancient lyrical successors. The medieval epoch had little use for the Odes, which did not appeal to its piety, although his Satires and Epistles were read because of their predominantly moralistic tones. The Odes came into their own again with the Renaissance and, along with the Ars poetica, exerted much influence on Western poetry through the 19th century.